Driving down a country road, a flash of chrome catches your eye as you pass an old farmstead. Next time you roll by, you slow down and focus on a shed behind the house. Could that be? Good lord, it is! Hard on the brakes, quick reverse, and pull in the drive. Yep, it’s a vintage Triumph Bonneville peering forlornly from beneath a tattered cover. You’ve just begun the journey that fuels the dreams of every motorcycle collector: the long-forgotten machine, re-discovered. 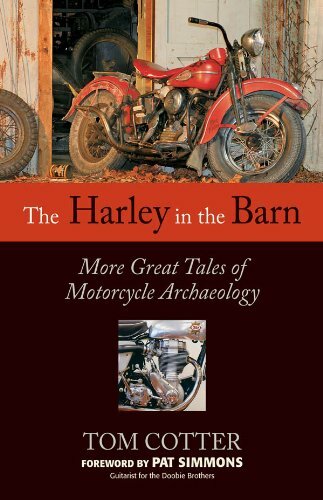 The Harley in the Barn offers 40-plus tales of lost Nortons, hidden Hondas, dormant Indians, and busted BSAs, all squirreled away from prying eyes but found by lucky collectors just like you. Author Tom Cotter is not only a barn-find master, he’s also master of discovering the collectors with the best stories and the most outlandish finds. If you can’t pass a padlocked garage without wondering if there’s a great old bike stashed inside, this is your book. Hell, this is your life.